The prestigious Madison International Padel Tournament comes back to Bushy Park Tennis & Padel Club for the fourth time from Friday 3rd to Sunday 5th May. 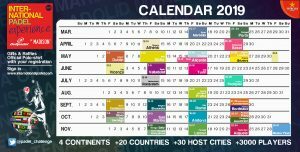 You will be part of an International Padel Circuit organised in 33 different locations around the world and with over 3,000 padel players! The Padel Federation of Ireland are hosting the tournament in Bushy Park Padel & Tennis Club in Terenure and in Rockbrook Padel Club in Rathfarnham. There are 4 categories: Men (A, B and C), Ladies (A and B), Mixed and Juniors (u14s and u17s). Great prizes and official polo shirt and Bullpadel gymsack for all participants (please see poster for further details). Entry Fee is €45 per team for adults and €15 per player for juniors. 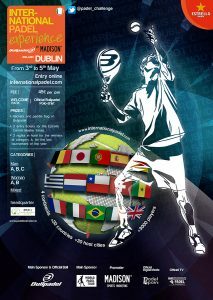 If you wish to take part please get in touch with us on info@padelfederation.ie or book online through https://internationalpadel.com/en/dublin-ipe2019/. Please state your full name, passport number, email address, mobile number and category / current padel level. Limited places. Early booking advisable. Sponsors: World Padel Tour, Bullpadel, Madison, Padel Ireland, Padel Spain, Padel Television, Estrella Damm and Premier Padel. 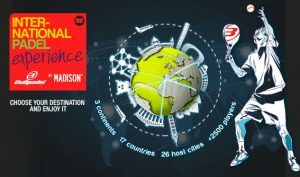 Enjoy the International Padel Experience by Madison! The tournament has nearly 100 players! Good luck to all. Please note that the next tournament is taking place in Cavan on the 6th and 7th April. Our staff will be on site to show you the facilities as well as introducing you to the new tennis, padel and fitness programmes. The coaches and staff will be all present to get you to try out tennis, padel and the fitness programme. There will be tennis and padel exhibition matches and visitors will be able to play with top players and the coaches. You can also try a bit of fitness and put your stamina to the test! You will also have a chance to win some cool prizes with the challenges organised by the coaches. Visitors can obtain full information on the adult and children programmes for the next few months in the Club.